We honoured Remembrance Day with a Remembrance Day Assembly at our school on Thursday. Led by our Grade 7 Assembly Committee, many classes gave presentations, including singing, reading poetry and explaining the history of the poppy. We learned about the Highway of Heroes, which was established to remember the Canadian servicemen and servicewomen from CFB Trenton who died while serving their country. 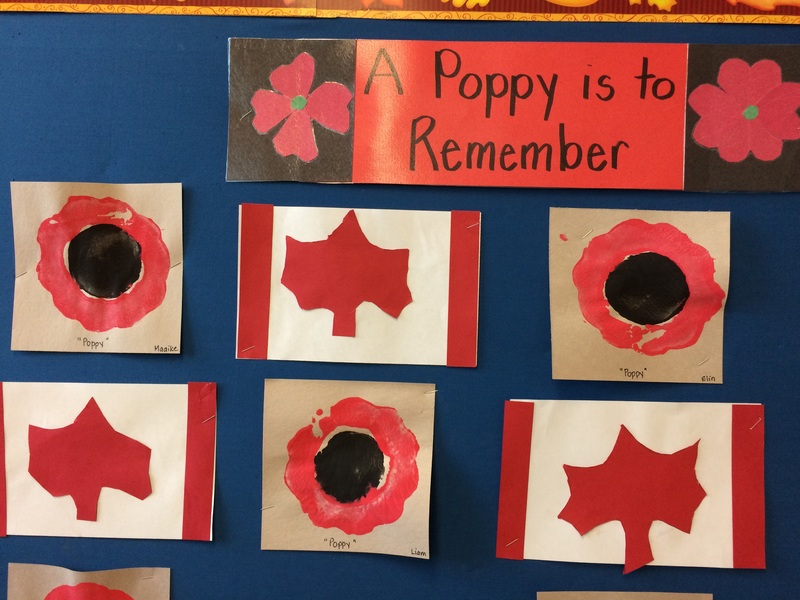 Sometimes people might think our Kindergarten children are too young to participate in a Remembrance Day Assembly. But actually, we believe they are at the right age. They take from the Assembly what they are able to understand, and for some of them, it’s a great deal. Many children have older brothers and sisters who were participating in the class presentations, we’ve been reading stories to give a context for learning; and we have made our focus on what peace means to each one of us. Peace is all peoples’ different ways of doing things. Everybody is different and has different ways. Then inspired by The Peace Book by Todd Parr, we’ve created this poem for you by your children, as they remember Remembrance Day. Peace is singing O Canada. Peace is looking at a rainbow. Peace is a Hawaii sunset. Peace is giving flowers to my mom. Peace is looking into Barsa’s eyes. Peace is hugging my whole family. Peace is looking at the stars. Peace is relaxing with my family. Peace is my mom and dad are different. Peace is being on a boat. Peace is listening to quiet music. Peace is my mom taking care of me. Peace is running for Terry Fox. Peace is playing kindly and sharing. Peace is playing the piano. Peace is loving your pets. Peace is hugging your family. Peace is cuddling with a blanket. Friday, November 11 is Remembrance Day and School is not in session. Monday, November 14 is a District-wide Professional Development Day and school is not in session. The card project samples went home this week. If you are interested in purchasing cards orders are due by Sunday, November 13 for delivery November 28. Later orders will be delivered by December 13. We are still collecting Hallowe’en candy for our Christmas Cracker Project. We are also now collecting toilet paper rolls (the rolls must be clear of paper and paper debris) and rolls of new wrapping paper and ribbon for the project. A sample of what is needed will be posted on the classroom parent boards. The Scholastic Book Fair is coming to Ridgeview from Monday, November 28, 2016 – Thursday, December 1, 2016. The book fair will be open daily from 8:30 a.m. – 4:00 p.m. There will be lots of wonderful books for purchase. It’s a great way to start your Christmas shopping all while supporting Ridgeview and helping build up our school library collection! Our sharing ends next week. Our next sharing focus will be “Christmas”. More info will follow via Remind.